Original Portuguese version at Sound(/)Zone. 3rd anniversary of Hard Club (version 2.0 – the original, at Cais de Gaia, would complete 16 years) and 20th of BIZARRA LOCOMOTIVA. But it was the fans who were entitled to a gift – for just 2 € more, they’d take home a remastered edition of the band’s self-titled debut album, which also included five tracks from its successor “First Crime Then Live” and a remix of “Fear Now” done by SWAMP TERRORISTS. A concert in Portugal of a Portuguese band hardly starts on time, so no one thought BIZARRA LOCOMOTIVA were late when they got on stage half an hour later than the scheduled 22:00 (truth be told, the majority of the crowd wasn’t exactly prompt). And if someone did think such thing, the excellence of the band’s performance – that kicked off with “Growth Pains” – soon made them forgive the slight delay. Not even the fact of playing in Room #2, on a smaller stage, did slow down Rui Sidónio‘s restlessness, who jumped and leapt through every free inch of that stage… and out of it. Sidónio jumped several times into the crowd – careful not to land on top of anyone – and “danced” with the fans. In fact, the closeness with them was pretty clear throughout the whole show: when he wasn’t on the move, Sidónio would kneel down in front of the fans and sang in their faces, very intimately. Also a “thank you” was said at some point, which in a BIZARRA LOCOMOTIVA gig is extremely rare – there are no words spoken, just the music pumping constantly, the gratitude expressed through smiles, clapping hands, fists over the heart and eventual bows. For more than one hour and a half, the most famous industrial band in the country ran through the 20 years they were celebrating, from “Apêndices” and “Gatos do Asfalto” to “Engodo” and “Egodescentralizado”, passing by “Desgraçado de Bordo” and “Homem Máquina”. After “O Escaravelho” they went backstage for a few moments, returning for a 3-song encore – “O Peixe Vermelho do Jardim dos Suplícios”, “A Procissão dos Édipos” and “O Anjo Exilado”. But it would be Miguel Fonseca‘s guitar that would end the show, in a sort of psychedelic solo that went on and on for several minutes, the guitarist on his knees and the instrument lying on the floor. They played “O Frio“, but Sidónio didn’t carry anyone on his shoulders, the “theatrics” kept to a roadie dragging the singer across the floor for a couple of times. But it was a mere detail that didn’t affect the satisfaction of the “beautiful scum” (scum = escumalha, part of the chorus in the song “Apêndices”) – petname which BIZARRA LOCOMOTIVA used on Facebook to address the fans – , the congratulations undoubtedly deserved beyond the anniversary. 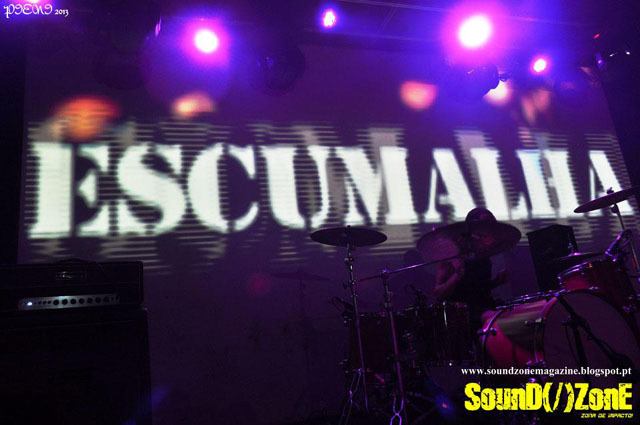 This entry was posted in Concerts and tagged BIZARRA LOCOMOTIVA, industrial, Rui Sidónio, Symbiose. Bookmark the permalink. I always save the best for last 😉 Thanks!